Collaborative expertise of attorneys from our Estate and Succession Planning, Corporate and Capital Markets, Securities, Tax and Partnership practices. Calfee’s Wealth Management Practice highlights a multidisciplinary approach to financial planning by calling upon the collaborative expertise of attorneys from our Estate and Succession Planning, Corporate and Capital Markets, Securities, Tax and Partnership practices. Our professionals work closely with our clients, their family offices, and other outside service providers to offer practical solutions to complex issues created by complicated business and family structures. With success often comes complication, and our Wealth Management team stands at the ready to guide you through ever-evolving matters related to your family, your investments and your business interests. The expertise of Partnership, Tax and Securities lawyers is critical when navigating the challenges posed by a family-operating business, partnership or limited liability company entities formed to manage complex investment structures, and the unique challenges faced by direct or indirect investments in private equity or venture capital vehicles. Our estate planning professionals are keenly focused on the issues surrounding efficient wealth transition and the challenges of arranging your affairs to reflect your unique family values and the responsible management and distribution of family wealth. We also work closely with the other members of the firm to develop effective business transition strategies focused on orderly management transition as well as efficient wealth transfer. While we work frequently with family office personnel, we also are experienced at analyzing the pros and cons of engaging the services of a multi-family office or the formation of a single-family office. The advent of the Ohio Private Family Trust Company and our experience in establishing such trust companies locally has made the family office conversation more timely than ever to many of our clients. The benefits of a full-service law firm are no more obvious than in our Wealth Management practice. 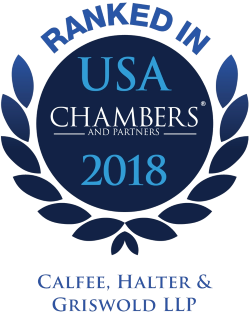 Calfee is ranked as a "Leading Law Firm" in Private Wealth Law (Ohio) the Chambers High Net Worth Guide 2018. Chambers HNW is the only independent directory specifically aimed at the private wealth market that ranks law firms according to their private client disciplines. Another Chambers HNW source mentioned, "They're extremely collaborative, they're comfortable being part of a team, communicating with everyone on the team and getting things done cost-effectively." A market insider highlights the firm's "strong reputation with small businesses," going on to explain that "they believe in personal relationships, they get intimately involved with businesses they represent. They understand the family dynamics of a small business."